Controversial singer Willy Paul recently dropped a new song dubbed Hallelujah; however looking at the video it’s quite hard to tell whether this is really a gospel song. Well, for sometime now Willy Paul has been releasing confusing songs and for a minute fans started assuming he had officially shifted to making secular music. His latest song Halleluyah has also left many wondering where to categorize it. However thanks to an recent interview where he was asked; “Watu wengine wamezungumzia nyimbo yako ya Halleluyah featuring Nandy kuwa Jina pekee ndo gospel hili unasema aje? Willy Paul responds He then went ahead to explain that this is a love song by saying; “It’s not a gospel song, but ni Love song, alafu you know mimi ni artiste naruhusiwa kuimba, unajua kwanza nikifanya na Rayvvany watu walishangaa sana, nimefanya na Nandy pia wameshangaa, sasa jua wameshangaa ya kutosha sijui next project watafanya nini sasa”. This is however not the first time the controversial artist is showing sings of shifting to the secular side. So far he has worked with a few secular artists including those signed under Wasafi records and probably soon he will announce his retirement from making gospel singer. 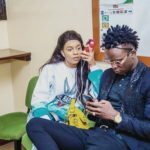 The post Willy Paul finally reveals whether ‘Halleluyah’ is a gospel song appeared first on Ghafla! Kenya.